Rachel Weisz attended the Academy of Motion Picture Arts and Sciences’ 7th annual Governors Awards on Saturday (November 14) in Hollywood, California. Whether she’s Daniel Craig’s plus one or front and center, the actress always puts forth a memorable appearance on the red carpet. 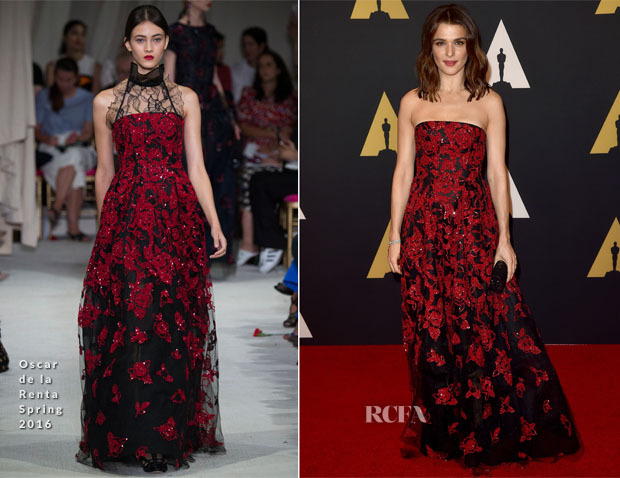 On this occasion she stole the spotlight wearing an Oscar de la Renta Spring 16 black tulle gown with ruby sequin flower embroidery. While I’m captivated by the dashing red hue and feminine appeal, I really miss the black lace ruffled neckline we see on the runway. It would’ve totally elevated Rachel’s look to something that felt more unique.